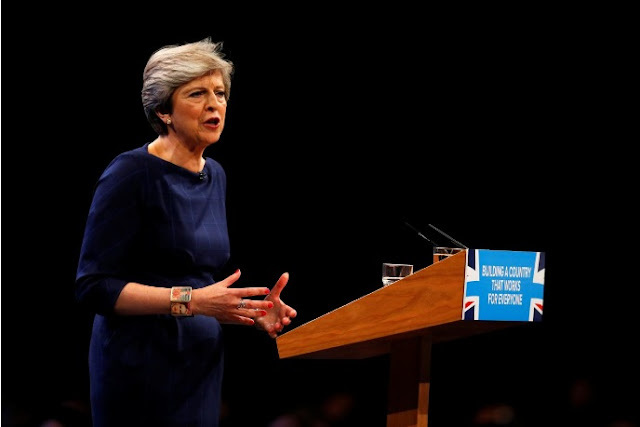 LONDON - Lawmakers in British Prime Minister Theresa May’s Conservative Party who are trying to oust her as leader have been told to “put up, shut up” by the party’s chief in Scotland. Others in the party warned that the uncertainty over May was damaging Brexit negotiations with the European Union. May on Friday said she would remain as leader after a former Conservative chairman said he had garnered the support of 30 lawmakers who wanted her to quit. It followed a disastrous speech at the party’s conference and a snap election in June in which May lost her party’s majority in parliament. Senior figures have rallied round May, but the open rebellion coincides with Britain’s crucial talks with the European Union just 18 months before Britain is due to leave. EU officials and diplomats have been stepping up preparations for a collapse in Brexit negotiations while one British newspaper reported on Saturday European negotiators were increasing talks with the opposition Labour Party amid concerns May’s government will flounder. Scottish Conservative leader Ruth Davidson, who is considered a possible successor should May be forced out, told the BBC the prime minister’s critics should “put up, shut up and get off the stage”. “I would tell my party to get its house in order, get together, knuckle down, and make sure that our first commitment, last commitment and only commitment is to the country,” she said. Her message came after former party chairman Grant Shapps toured media studios calling for a leadership election. Shapps said 30 Conservative lawmakers backed his view, well short of the 48 needed to trigger a contest. Commentators said a lack of an obvious replacement and deep divisions in the party over the direction of Brexit meant the rebellion had lost momentum despite disquiet over May’s performance as leader. “The sniping from people like Grant Shapps is ... going to be used by people like Michel Barnier and Juncker to say there’s divisions within the government, maybe we can offer them a worse deal or drag things out,” Evans told BBC TV. Amid the internal wrangling in May’s party, EU officials say they have been stepping up preparations for Britain crashing out of the EU in March 2019 with no deal with the bloc in place. The Federation of German Industries, meanwhile, warned on Thursday German firms should prepare for a “very hard Brexit”. The Financial Times reported on Saturday that Germany and France had dashed hopes of fast-tracking talks a two-year transition deal after Brexit, and instead wanted details of the divorce settlement resolved first. EU negotiators had also increased private talks with Labour leader Jeremy Corbyn fearing May’s government would fall before a divorce deal was agreed, the Daily Telegraph reported. As May tries to reassert her authority, the Guardian newspaper said she would be urged by her lawmakers to sack Foreign Secretary Boris Johnson who used media article and interviews ahead of this week’s party conference to put forward his own view of Brexit. While he professed loyalty to May, his interventions were seen as undermining her and causing unnecessary unrest. “There’s a general feeling that there’s support for her there, but I do think she needs to do a major reshuffle, and if she doesn’t act to sack Boris and to bring some new people on board, she has a problem,” one unnamed Conservative lawmaker told the paper. Lawmakers in British Prime Minister Theresa May’s Conservative Party who are trying to oust her as leader have been told to “put up, shut up” by the party’s chief in Scotland.